As of November 30, 2016 the Museo delle Navi Antiche in Pisa opened its doors for two of the eight rooms which will showcase over 30 restored or re-created vessels from the Roman period and early Middle Ages. The bulk of the vessels to be exhibited were recovered from the ancient Etruscan and Roman port situated near today’s San Rossore train station in Pisa. 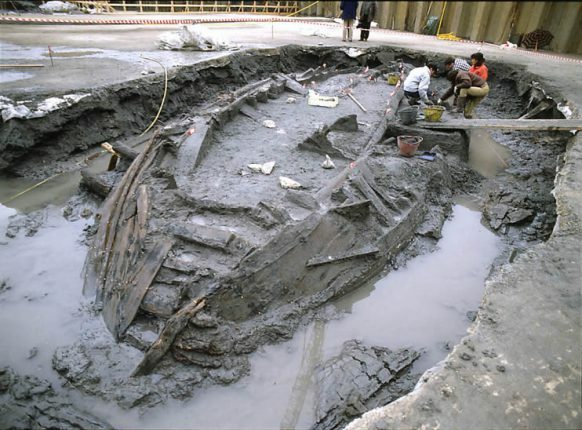 The archeological digs outside of Pisa from 1998, better known as the “Pompeii of the Seas”, are providing researchers, archeologists and historians a wealth information and stranded vessels from varying epochs to be restored and exhibited at the museum – including 13 complete seafaring vessels and river boats. In total they have found about 30 ships dating from between the third century BC and seventh A.D. with their full payloads of jewelry, utensils, pottery, amphorae, and coins. All of this was uncovered after work was initiated on the local train tracks. Boasting of over 10,500 square meters, the space is divided into actual excavation, laboratories and restoration center. It is perhaps one of the largest archeological digs ever, both in or out of Italy. 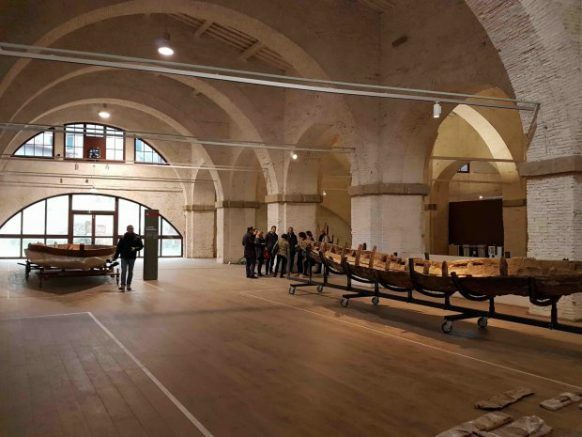 The museum combines the ‘Center for the Restoration of Wet Wood’, the skeletons of these antique boats and the newly restored ‘Arsenali Medicei’ from the 1500’s. The Arsenal was built by Cosimo I de’ Medici’s as a shipyard in Pisa for the vessels construction the Tuscan fleet. The restoration makes excellent use of the spacious building from the 1500’s dedicated to putting Pisa back on the ‘boat-making map’. The final project is expected to contain not only 8 exhibition hall featuring all of the restored vessels, but also several thematic halls with approximately 4,800 square meters including information on the function of water in Pisa, the history of water transport, and the general history of this lovely city. An exceptional find over 15 years ago! The boats were sunk in the mud, totally absent of oxygen which would have initiated the deterioration of the wooden vessels and their loads. Due to the unique burial situation there has been a treasure trove of special findings of everyday pieces: on-board equipment, ropes, hawsers (cable for mooring or towing a ship). Especially exciting are the artifacts in plant fibers which were found intact like bags, baskets, and mats. The official website is www.navipisa.it, however it is a bit outdated and does not include information on the new opening and exhibition rooms as of yet. Located on via Ranuccio Bianchi Bandinelli (once known as via Andrea Pisano 64) it is only a ten minute walk from the tower of Pisa, simply follow the road Lungarno Simonelli till you reach the train station Pisa/S. Rossore. Be sure to include the date you would like to visit, the name of the museum and the number of persons in the group. Cost is 6 Euro person and children under 6 enter free when accompanied by their parents.